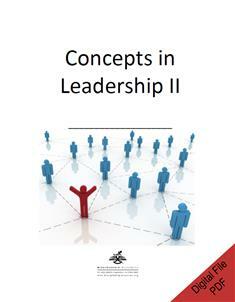 Concepts in Leadership II is designed to be a refresher course for local church lay speakers, but it may be used for leadership development in any setting. Designed to be taught in one 5-hour session, this PDF-formatted course may be divided into multiple sessions for use in a Sunday school class or small-group setting. Formulate specific purposeful leadership techniques in a process of discovery and evaluation of their church's unique missional response. These two titles are available as PDF downloads.